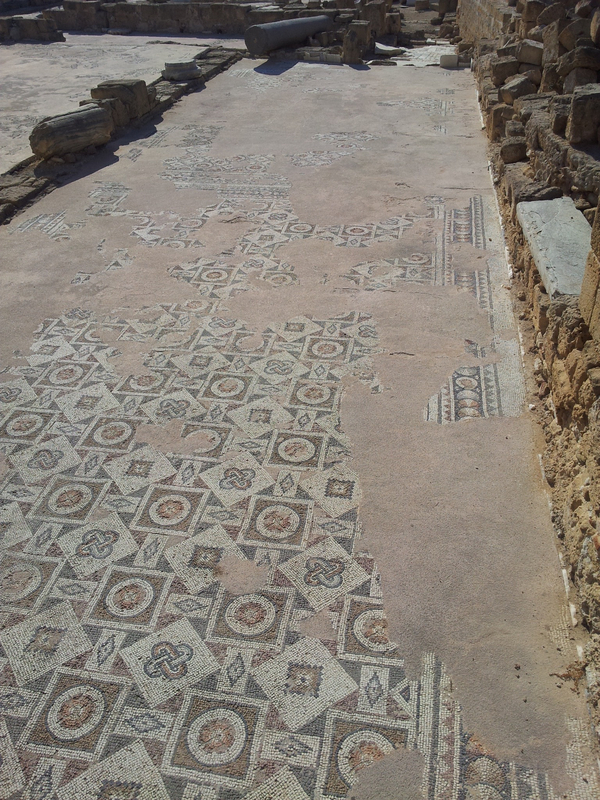 Cyprus lives with history – seeing beautiful ancient mosaic floors, Ionic columns, collapsed roofs of ancient buildings is common here …. 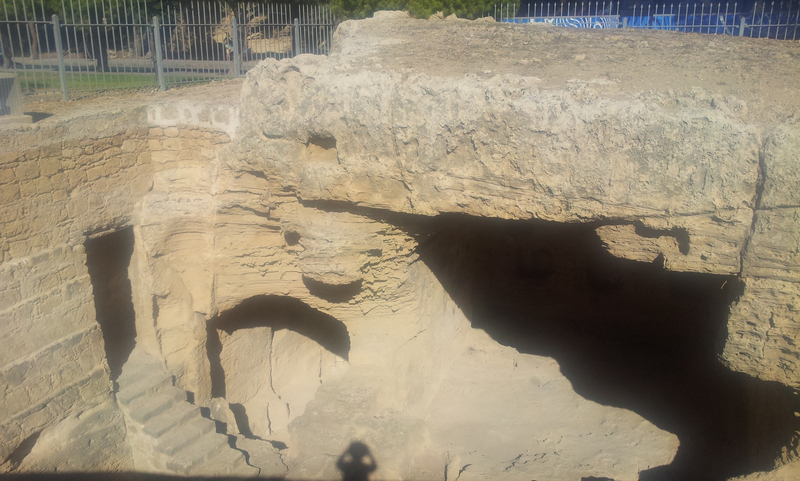 to the point that it is on display on main street .. below are some examples .. the one is the other side of the road from Saint Solomon’s Catacombs, the other photograph in the main street of Paphos. 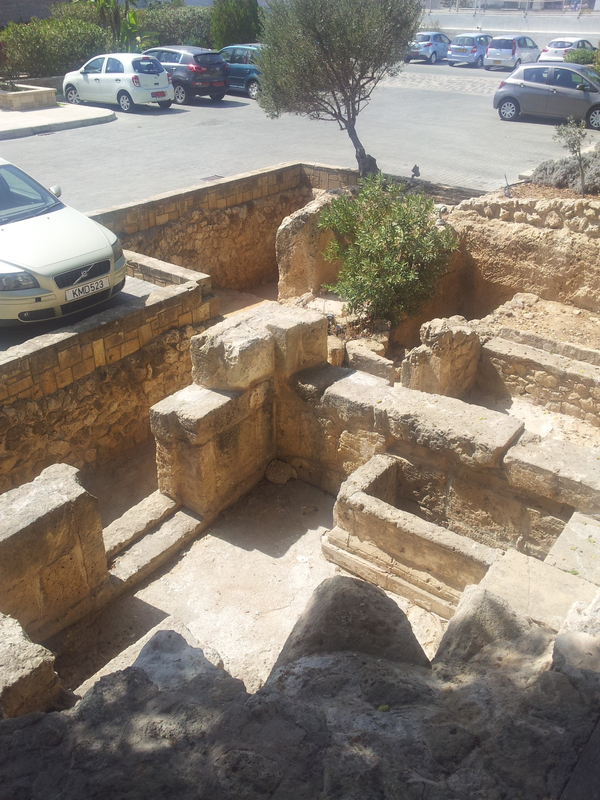 It is refreshing to see the past valued – indeed there are many archaelogical sites of Paphos which as yet may not be fully excavated and hence understood, this may take many decades. The earliest attested reference to Cyprus is the 15th century BC Mycenaean Greek, the earliest known human activity on the island dates to around the 10th millennium BC. 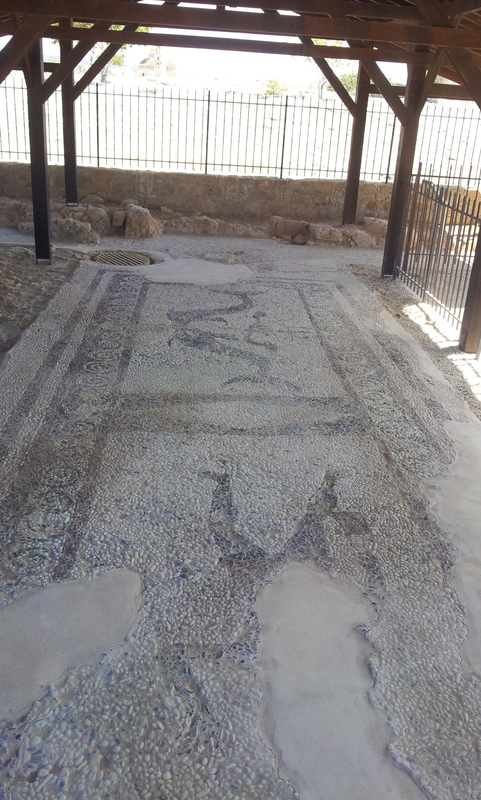 Archaeological remains from this period include the well-preserved Neolithic village of Khirokitia, and Cyprus is home to some of the oldest water wells in the world. Cyprus was settled by Mycenaean Greeks in two waves in the 2nd millennium BC. As a strategic location in the Middle East, it was subsequently occupied by several major powers, including the empires of the Assyrians, Egyptians and Persians, from whom the island was seized in 333 BC by Alexander the Great. Subsequent rule by Ptolemaic Egypt, the Classical and Eastern Roman Empire, Arab caliphates for a short period, the French Lusignan dynasty and the Venetians, was followed by over three centuries of Ottoman rule between 1571 and 1878 (de jure until 1914) .. The Republic of Cyprus was formed when Cyprus was granted independence in 1960. 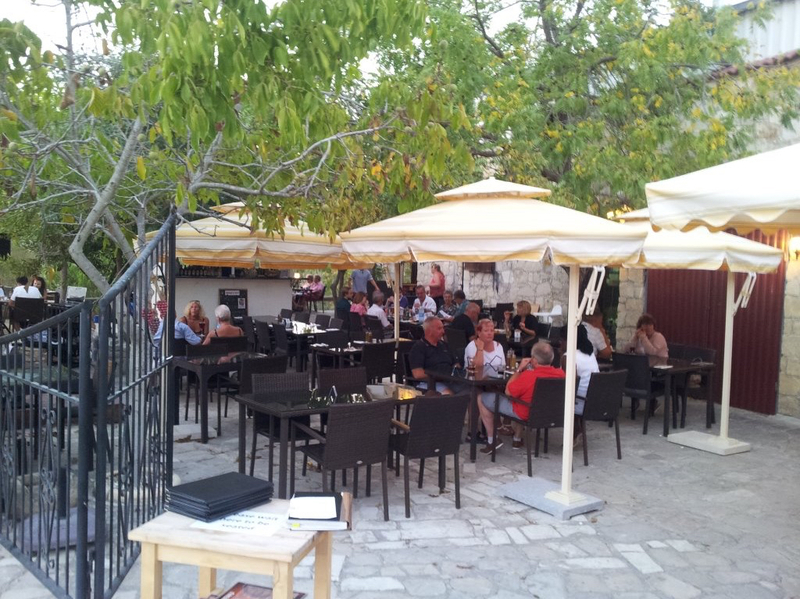 On a tour of Cyprus we ended up at Aprodite’s Rock Brewing company …. a family run micro brewing business that make great cider and incredible Pizza’s, with one in particular taking my total attention. With Figs, capers. 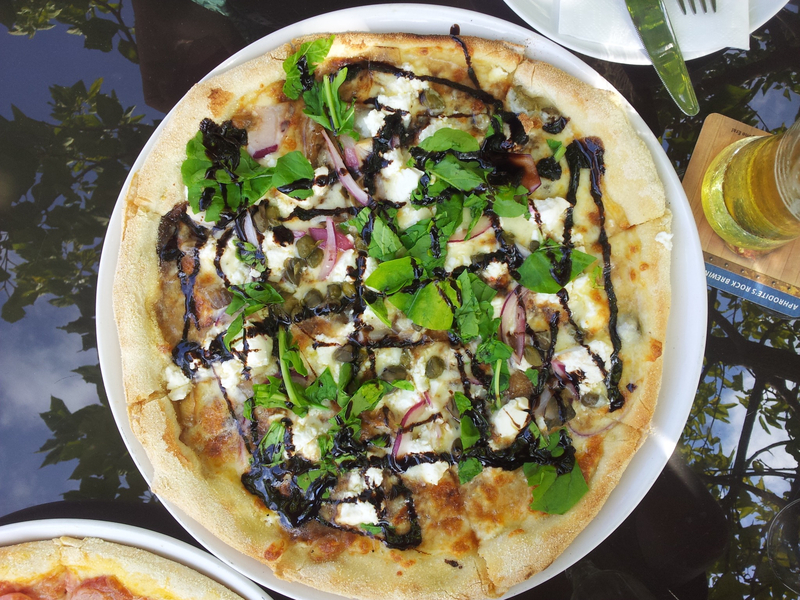 goats cheese ( two types, hard and crumbly goats cheese), rocket, caramalised red onions, with a balsamic vinegar reduction and olive oil … it is one of the best Pizzas I have tasted. You can find Aphrodite on the web here ..